Now that World War II was over and a more optimistic mood swept across the country, glamour returned to the awards ceremony. 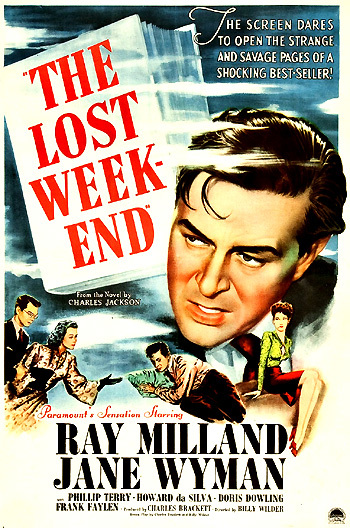 But the Best Picture award was presented to producer/director/co-writer Billy Wilder's four-Oscar winning, socially-significant The Lost Weekend, a grim, realistic, downbeat drama based on Charles Jackson's best-selling novel and the first major Hollywood film to deal with the subject of alcoholism in a serious tone. Some consider Wilder's humiliation the previous year with his seven-time nominated film Double Indemnity (1944) (with no wins) was one of the main factors for his tremendous win this year. This time, Wilder's Best Picture film won four of its seven nominations. 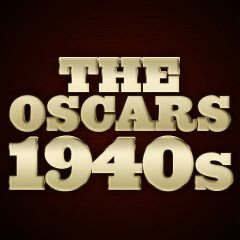 This was also the first time that the Best Picture Oscar winner also won the prestigious top prize (known as the Grand Prix) at the Cannes Film Festival. The meaningful film, from Charles Jackson's adapted novel, won four major awards - Best Picture, Best Director, Best Actor, and Best Screenplay. Director Wilder won Oscars for Best Director and Best Screenplay (shared with Charles Brackett). Brackett and Wilder were producers-directors of the previous year's Double Indemnity (1944). They would collaborate together in the future with A Foreign Affair (1948) and Sunset Boulevard (1950). Leo McCarey's The Bells of St. Mary's (with eight nominations and one win - Best Sound Recording), the sequel to the previous year's award-winning Going My Way (1944). This time, the film told the story of an easy-going priest who battles with the Mother Superior of parochial St. Mary's School. Cornel Wilde (with his sole career nomination) was nominated for his role as pianist/composer Frederic Chopin in the biopic A Song to Remember (with six nominations and no wins). The winner in the Best Supporting Actress category was Anne Revere (with her second of three career nominations - and sole Oscar win) for her role as Elizabeth Taylor's supportive, strong-faced mother Mrs. Brown, who helps her daughter train for the Grand National race in director Clarence Brown's National Velvet (with five nominations and two wins - Best Supporting Actress and Best Film Editing). There were many serious omissions and problems with this year's awards. Why was Anchors Aweigh given a Best Picture nomination and four other nominations, when Edgar Ulmer's noir classic Detour was unrecognized? Another noir film was also un-nominated: Robert Siodmak's The Suspect. Edward G. Robinson and co-star Joan Bennett were un-nominated in two Fritz Lang noir films: The Woman in the Window (1944) and Scarlet Street. Boris Karloff (never nominated for an Oscar in his entire career) was ignored in Val Lewton's superb B movie horror classic The Body Snatcher. Elia Kazan's feature directing debut film A Tree Grows in Brooklyn was denied Best Director and Best Picture nominations, and a Best Supporting Actress nomination for Joan Blondell. John Ford's They Were Expendable also received only two minor nominations - the film's major star John Wayne was un-nominated. Vincente Minnelli's and MGM's romantic drama The Clock received no nominations - it told about Alice Mayberry (Judy Garland in her first non-singing role), an all-American single working girl, and young soldier Corp. Joe Allen (Robert Walker) on two-day leave in New York. They happened to meet in Penn Station, fell in love, and hastily committed to marriage -- and because time ran out -- had the ceremony in a diner. Likewise, Michael Curtiz' multi-generational domestic epic Roughly Speaking was also devoid of nominations, particularly for Rosalind Russell's portrayal of real-life Louise Randall Pierson (the film's scriptwriter, based on her autobiographical novel), a strong persevering woman who endured numerous setbacks including two marriages, the Depression, polio and four children. It was a role that Bette Davis reportedly turned down. And Robert Mitchum, who lost his sole Oscar nomination in 1945 for a minor role in The Story of G.I. Joe, wasn't even nominated for his better and greater roles for the rest of his film career, in Thirty Seconds Over Tokyo (1944), Out Of The Past (1947), Crossfire (1947), The Night of the Hunter (1955), Heaven Knows, Mr. Allison (1957), The Sundowners (1960), and Cape Fear (1962).